Locations, buildings, pastel colours, and symmetry are all elements that give Wes Anderson films that distinctive “Wes Anderson” feel. With his instantly identifiable, retro style, it’s no wonder that his films resonate with so many people, particularly who have an affinity with aesthetics. Brooklyn-based Wally Koval is one of these people. After discovering the Accidental Wes Anderson subreddit - a platform where users were sharing photographs of locations which looked straight out of an Anderson film, the idea was born, to take the devotion to Instagram. An enthusiastic traveller, Koval recognised the presence of the Anderson aesthetic in many of the buildings, settings and scenes of the countries he was visiting. 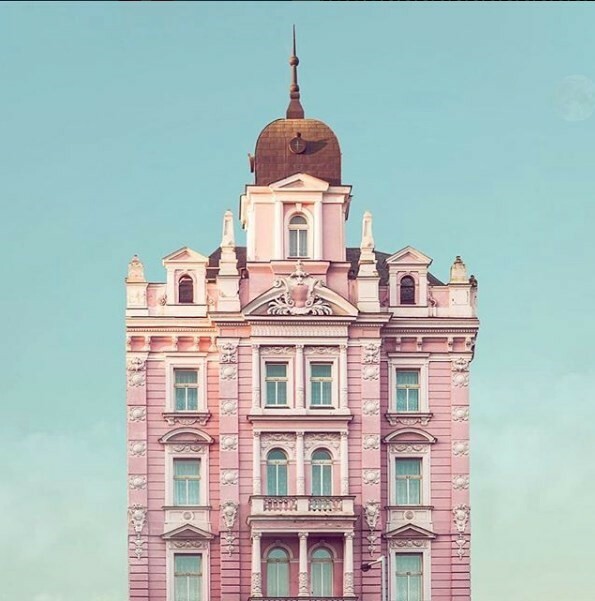 Through the careful curation of unique, close-symmetrical buildings on the Instagram page, Koval celebrates the individuality and peculiarities we see in the sets of Grand Budapest Hotel, The Royal Tenenbaums and Moonrise Kingdom. And with hundreds of submissions a day, he’s spoiled for choice. Koval’s account has been – and continues to be – so well received that even Wes Anderson has seen it; “I’m beyond thrilled to hear he has seen the account!” says Koval. We spoke to him about running the account and whether working for Wes is his dream job. How did you become interested in "collecting" the aesthetic of Wes Anderson? What started it all? Wally Koval: The inspiration for this project stemmed from a few places: I’ve always been enthusiastic about travel with a desire to see as many countries and experience as many cultures as possible. I also happen to be a huge fan of Wes Anderson – specifically his ability to cultivate a scene and provoke emotion through the settings in his films. This actually encouraged some of my adventures across India and Europe. So, when I happened upon the Subreddit, I became fascinated with these real life Wes Anderson-esque locations, some existing in the very same cities that I’ve traveled. In digging a bit deeper, I found that what brought these places to life were the histories and unique stories behind the beautiful facades. If you could pick one building in the world that perfectly captures the spirit of @accidentallywesanderson, which one would it be? Wally Koval: There are so many buildings that I have featured, and many we have in the queue that embody the aesthetic – all different shapes, styles, colors, and each with a vastly different history. I don’t think there is one particular building that captures the spirit of the project as much as it is the overall collection as a whole. What makes for a perfect "Wes Anderson" location? Wally Koval: This is something we think about and discuss constantly! Every photo we post to the feed is carefully curated, making sure that it fits in with the overall aesthetic. This means the images embody a level of symmetry and a touch of colour - whether a pop of pastel or a broader palette - and most importantly, something unique or atypical.While we may never come to a definitive description of the aesthetic, it's something that we know as soon as we see it! This is what Wes Anderson said in our interview about your Instagram: "It’s where people see something they think that could have been in one of my movies. It’s architecture mostly, pastels. There’s an emphasis on North Korea or Bulgaria, that wonderfully fascist strain of architecture... (laughs nervously) It’s like they’re location scouting." Why do you find there's an emphasis on North Korea and Bulgaria? Wally Koval: I’m beyond thrilled to hear he has seen the account! I guess those first couple photos posted from North Korea and Bulgaria just screamed symmetry and had some interesting pops of pastel as he mentioned. Now we typically receive the majority of submissions from Europe - Budapest, Berlin, Copenhagen, etc. - as well as locations all over India, South America, Japan, Russia, you name it. It’s a nice reminder that the world is a massive place and the project could literally go on forever! I’d like to think that we have started to explore a bit beyond the basic roots, delving further into the unique architectural nature and interesting narratives behind each of the locations we feature. I hope he continues to follow along, and again, so happy to hear he has seen it! Would you quit your day job to be a location scout for Wes Anderson? Wally Koval: How do you say “in a heartbeat” without sounding too eager? My fiancé and I work full-time while facilitating this project – which can definitely be a lot of work. However, there is no doubt this is a passion of ours and we sincerely enjoy this community and exploring new destinations more than anything! If we were somehow able to focus on it full time, I don’t think there would be any greater joy. How many submissions do you get a day? Do you have any superfans, people who constantly send in? Do you think Wes has ever sent one in? Wally Koval: Our community is the foundation of AWA and we value every submission we receive. While we are always actively hunting for locations ourselves, at the moment, we’re sifting through hundreds of daily submissions and suggestions sent in via email, direct message, and social mentions. It’s astonishing to see how engaged the AWA community has become, and Amanda and I make every effort to respond to each correspondence. We definitely have a number of ‘adventurers’ that consistently contribute top notch suggestions/submissions on a regular basis, and they are amazing! While I’m not sure Wes has ever submitted a location, I’d imagine if he did, it would do pretty darn well! I mean, who knows the aesthetic better than the man himself! Could you pick your favourite one that you have on the account and tell us why? Wally Koval: That is akin to asking someone to choose their favorite child! In all honesty, I think I will have a favorite post and then we receive a submission highlighting another amazing piece of architecture that I never heard of before boasting a history so interesting I want to dive in even deeper. So even if I picked one today, I would have a new “favorite” tomorrow!